When the best movie theater in the area is right in your living room, you need the perfect snack to accompany the feature film! Thanks to the Wabash Valley Farms Whirley Pop Stovepop Popcorn Popper, you can have 6 quarts of delicious, perfectly cooked popcorn in just 3 minutes! 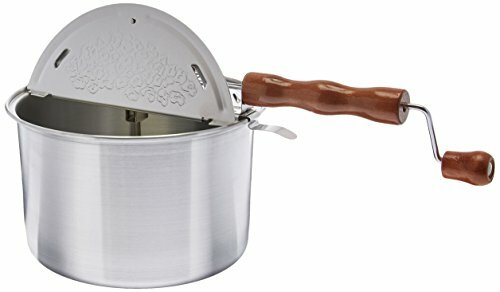 This stovetop popcorn popper also has a patented stirring system so you never have to worry about burning or ruining your popcorn – each kernel moves until it is popped – up to 42 times its original size! Additionally, the lid includes metal gears, which is great for kettle and caramel corn recipes. Not just for movie night, this stovetop popcorn popper makes the perfect snack for parties, housewarmings or even just for a night in with family. You don’t have to worry about creating a big mess, either, cleanup is a breeze – just wipe with a paper towel and store for later use! 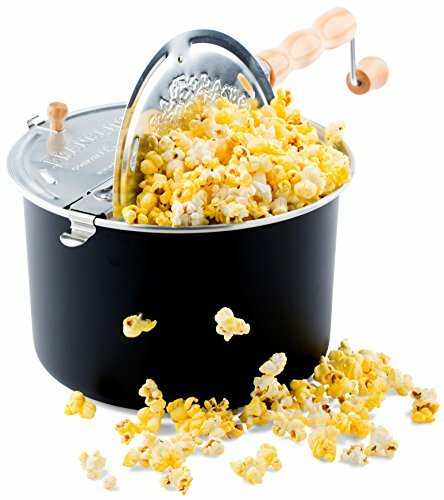 This stovetop popcorn popper makes for a great gift for the movie or popcorn lover in your life, or just a fun item to have ready to go in your kitchen when the popcorn craving strikes! 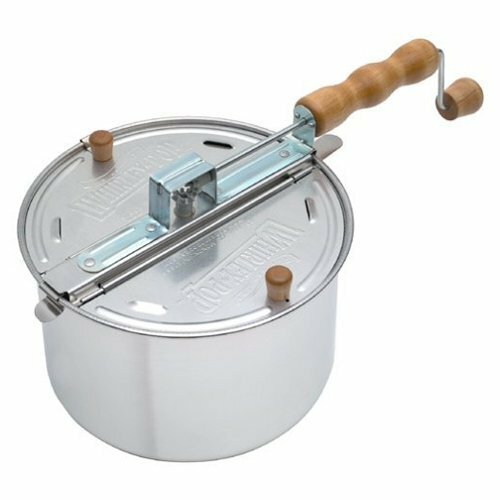 The Original Whirley Pop Stainless Steel Popper makes 6 quarts in less than 3 minutes. The hand cranked popper is the best way to make movie theater style popcorn at home. Steam release means tender crisp popcorn. The sturdy stainless steel construction with heavy duty metal gears lets you pop batch after batch, popping each kernel and eliminating burning. Make sure to register your popper with Wabash Valley Farms for your 25 year. When the best movie theater in the area is right in your living room, you need the perfect snack to accompany the feature film! Thanks to the Original Whirley Pop Stovepop Popcorn Popper, you can have delicious, perfectly cooked movie theater popcorn in just 3 minutes! This popcorn popper also has a patented stirring system so you never have to worry about burning or ruining your popcorn – each kernel moves until it is popped – up to 42 times its original size! Not just for movie night, this stovetop popcorn popper makes the perfect snack for parties, housewarmings or even just for a night in with family. You don’t have to worry about creating a big mess, either, cleanup is a breeze – just wipe with a paper towel and store for later use! 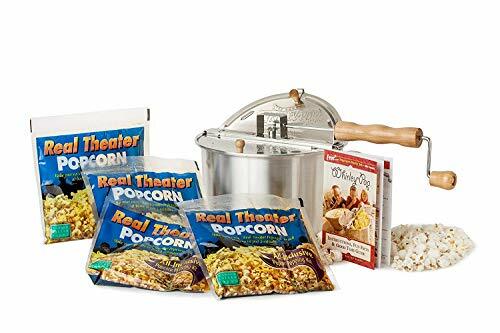 This stovetop popcorn popper comes with 3 popcorn popping kits that include fresh popping corn, our secret buttery salt and gourmet popping oil – everything needed to create authentic, delicious movie theater popcorn. To complete the movie night experience, 4 disposable, authentic popcorn tubs are included. It makes for a great gift for the movie or popcorn lover in your life, or just a fun item to have ready to go in your kitchen when the popcorn craving strikes! 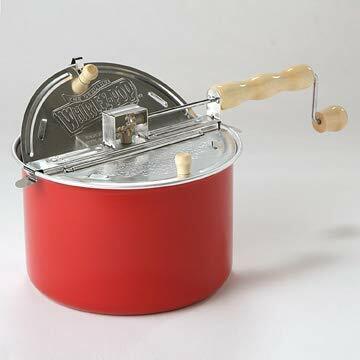 Franklin's Original Whirley Pop Stovetop Popcorn Machine Popper. Delicious & Healthy Movie Theater Popcorn Maker. FREE Organic Popcorn Kit. Makes Popcorn Just Like the Movies. 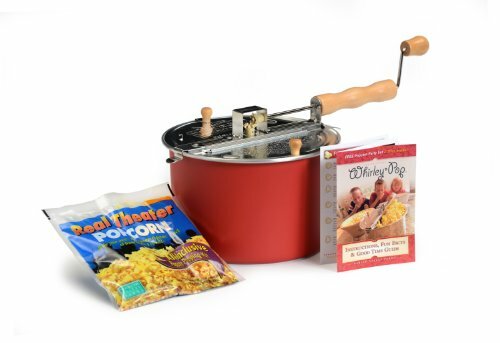 Franklin's Gourmet Popcorn is pleased to offer the Franklin's original Whirley Pop popcorn popper. 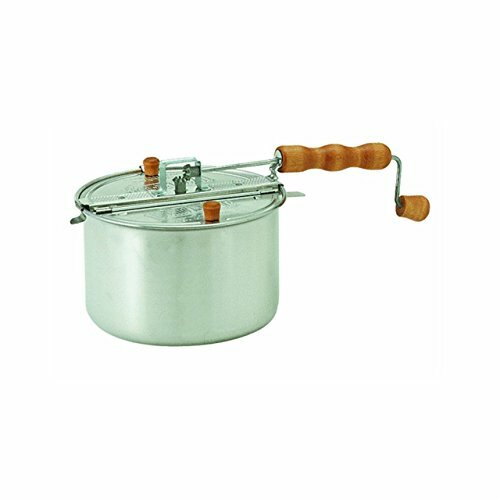 The extra large 6 qt kettle is made of aluminum which distributes heat better than stainless steel. All metal gears are used in the patented stirring mechanism which prevents sticking or burning as the kernels are stirred until every kernel is popped. Clean up is a snap! Simply wipe down with a wet paper towel after each use. Franklin's offers a LIFETIME warranty on the Franklin's Whirley Pop popper. One FREE Franklin's Gourmet Popcorn pre-measured popcorn pack is included. Use with either the Franklin's Gourmet Popcorn 2 oz or 4 oz pre-measured popcorn portion pack (available for purchase on Amazon) to make delicious original movie theater tasting popcorn at home! When your favorite movie theater is right in your living room, you need the perfect snack to accompany the feature film! 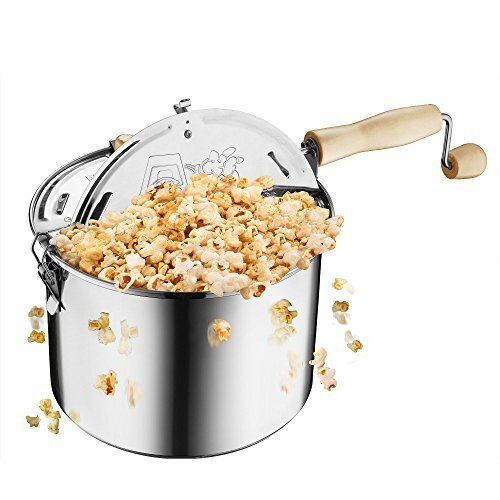 Thanks to the Original Silver Whirley Pop Stovetop Popcorn Popper, you can have delicious, perfectly cooked movie theater popcorn in just 3 minutes! It makes for a great gift for the movie or popcorn lover in your life, or just a fun item to have ready to go in your kitchen when the popcorn craving strikes. 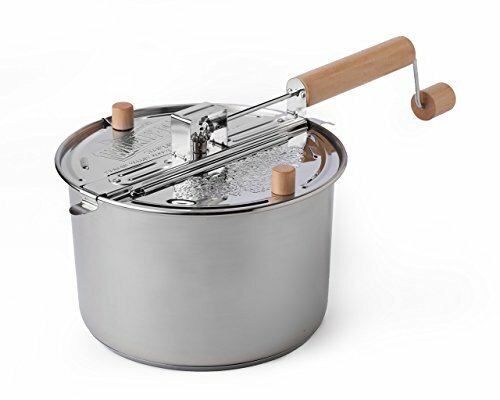 This popcorn popper has a stay-cool wooden handle and a patented nylon stirring system so you never have to worry about burning your hand or your popcorn! With this popcorn maker, you’ll never have burnt popcorn. The patented stirring system works by moving every kernel until it pops – up to 42 times its original size! Not just for movie night, this stovetop popcorn popper makes the perfect snack for parties, housewarmings, or even just for a night in with family. You don’t have to worry about creating a big mess, either. Cleanup is a breeze – just wipe with a paper towel and store for later use! The Original Red Whirley-Pop makes it easier than ever to have the ultimate popcorn experience at home. With as little as one teaspoon of any cooking oil and three minutes you can create delicious mouth watering popcorn at home to enjoy.Each smart looking Barn Red Popper is hand assembled, checked for quality and has a 25 year warranty on moving parts through Wabash Valley Farms. Makes 6 Quarts, that's twice as much as a standard microwave popcorn and twice as delicious. Shopping Results for "Whirley Pop Stovetop Popper"